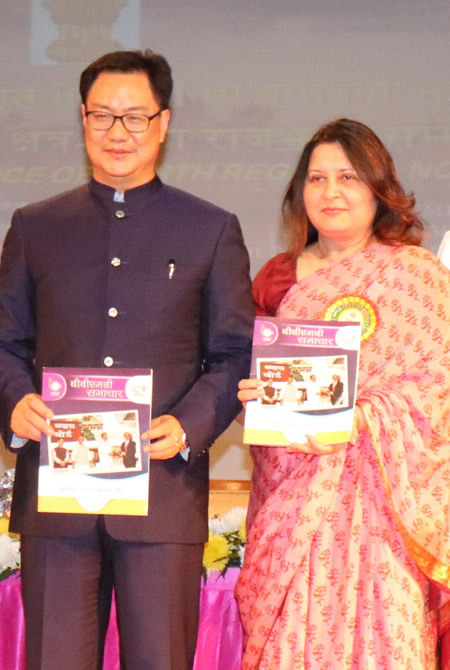 Photo: India Minister of State for Home Affairs, Kiren Rijiju, releasing a magazine, at the Official Language-Hindi Conference (Sammelan) and Award Ceremony of North Region, in Chandigarh on November 19, 2018. Chandigarh, India, November 19, 2018 — The Regional Conference under the aegis of the Department of Official Language, Ministry of Home Affairs, was organized by Regional Implementation Offices of North-1 and North-2 Regions in Chandigarh today. Central Government Officials from Delhi, Punjab, Chandigarh, Haryana, Himachal Pradesh, Jammu & Kashmir, Rajasthan, Uttar Pradesh, and Uttarakhand participated in the conference. Union Minister of State for Home Affairs, Kiren Rijiju, was the Chief Guest in the conference. Mr. Rijiju said that crores of people in the country speak Hindi. They think and express their ideas in Hindi; Hindi is the medium of expression of all the elements of Indian culture and society. We should remember that Hindi is the language of ordinary people of the country. He added that Hindi was not only the language of freedom struggle but is also the language of social interactions. Mr. Rijiju gave away awards among winners of various Central Government Offices, Banks, PSUs and Town Official Language Implementation Committees (TOLICs) situated in these regions towards implementation and promotion of the Official Language Policy of the Union. The Joint Secretary, Department of Official Language, Dr. Bipin Behari had convened the conference. He informed that the Department is developing new tools such as Kanthasth Mobile Version and Memory based translation tools. Addressing the conference, Dr. Chaman Lal Gupta, Vice President of Indian Institute of Higher Education, Shimla said that the new generation should learn and use Hindi. The Head of Department of Hindi, Panjab University, Chandigarh, Dr. Gurmeet Singh advocated that Hindi should be easy to use; we should not differentiate between literary and working Hindi and that the use of Hindi in the field of technology is essential. There must be coordination between translators, teachers, journalists, and writers, he added.